For wholesale and bulk orders, please email: info(at)strangeboatpublishing.com or call 415 383-8779. 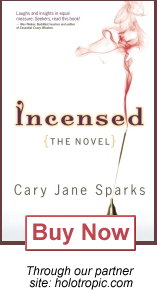 Incensed: The Novel by Cary Jane Sparks is the first book released under the imprint of Strange Boat Publishing. The company name comes from the song “Strange Boat” by the Waterboys. We’re sailing on a strange boat, living in a strange time, blown by a strange wind, working for a strange goal.